Abrasive belts with ceramic grain are a grinding material that satisfies the highest requirements with regard to aggressiveness and the corresponding grinding output. The aggressive cutting effect of the ceramic grain and the grinding active additives in the surface make these tools particularly suitable for work with high-alloyed, rust and acid-resistant steels (INOX), titanium, nickel-based alloys and extremely hard workpiece surfaces (e.g. mill scale). Abrasive belts with ceramic grain provide the highest possible surface quality while generating very little heat. This results from the abrasive belt’s special design with ceramic grain, which provides for especially cool grinding, with special grinding additives. Continuously high output because of an optimal utilisation of the abrasive belt. A special advantage derives from the fact that the ceramic grains sharpen themselves again and again during grinding and in this way maintain their aggressiveness. The ceramic grain almost completely prevent clogging of the abrasive belt. Additional grinding active additives contribute significantly to the highest possible grinding output and to a long service life of the abrasive belt. Fewer work steps and the corresponding cost reduction connected with faster treatment of workpieces, while at the same time improving the surface quality, justify the use of abrasive belts with ceramic grain. On poor heat conducting materials, abrasive belts with ceramic grain ensure an optimal grinding result without thermal damage to the surface of the workpiece. 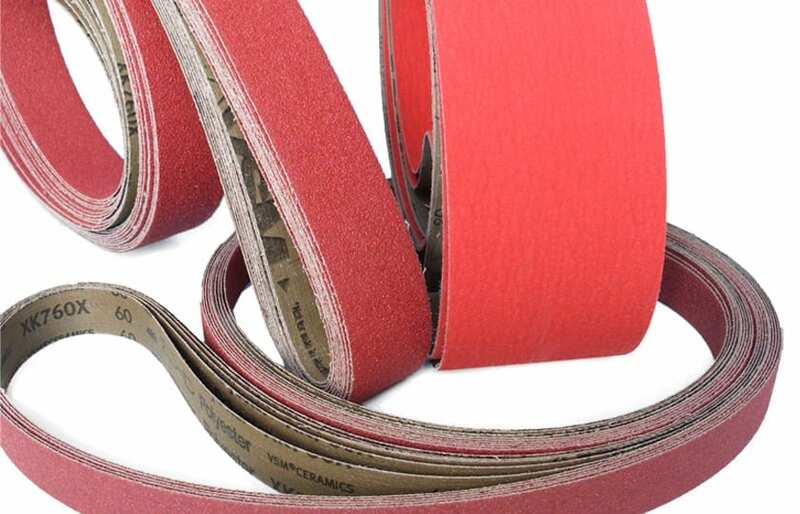 Abrasive belts with ceramic grain should always be used with the right contact wheel. 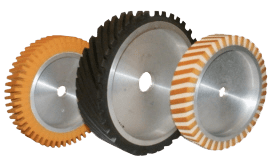 For dry grinding we recommend our frequency dampened contact wheel FAPI-KS/V with which an additional grinding output up to 40% can be achieved.